There’s a quince tree in my yard. It was planted long before I arrived, and now in the fall the fruit is beautifully full and yellow and blemish-free without pesticides. Raw quince is NOT tasty. Cooked is a different story. As a meat sauce or jam, it’s an old world delight! So why this juice recipe using a bitter raw fruit? Two reasons. First, I like the challenge of creating a great tasting juice out of impossible foods. I did it with wheatgrass and garlic so maybe I can do it with quince! Second, this is a great opportunity to wave the flag about the importance of more raw food in our diet. Nutrients in raw fruit and veggies are not found anywhere else – not in the best supplements, not in anything bottled or canned, not even in the best home cooked meal. It’s estimated that as much as 100% of enzymes and 50% of phytonutrients are lost when we cook, process or store fresh food. Ok I made my point. So now let’s talk about quince. Native to Asia Minor, quince was once a popular fruit but has taken a backseat in modern times. Considered too hard and tart to eat raw, but when cooking, quince turns red, softens and sweetens with a floral fruity aroma. It is believed that the quince, not the apple, was the forbidden fruit of the Garden of Eden. Greek mythology associates the quince with Aphrodite, the goddess of love, and many believe that the golden apple given to her by Paris was a quince. Another thing quince has going for it is lots of natural pectin, the compound in some fruits that thicken jams and jellies. A soft quince is a rotten quince, so purchase them rock-hard. Quince should be yellow and feel heavy and firm with no bruises. As you can imagine, quince is not yet well studied, but traditional medicinal uses include a powder, extract, or tea for digestive disorders including stomach and intestinal pain as well as diarrhea. Quince has also been used for cough. Quince is low calorie fruit with more antioxidants than apples or pears. Quince is rich in fiber, and gritty granules in the pulp are composed of astringent compounds known as catechin and epicatechin which are known to protect the colon from cancer-causing toxins and chemicals. Other compounds in quince help reduce bad (LDL) cholesterol levels. It has several phenolic compounds and essential oils that give quince its unique fragrance. Ripe quince is a great source of vitamin B and C as well as the minerals copper, iron, potassium and magnesium. Although not yet conclusively studied, quince, like pears, has anti-allergenic and anti-inflammatory properties. Success! 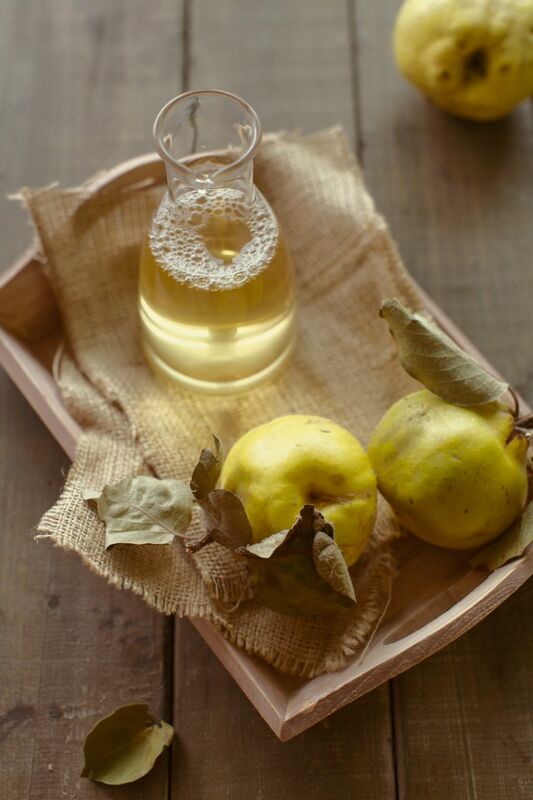 This is a really great tasting quince juice recipe! Juice or smoothie the entire quince, pumpkin, lemon and apple – skin, rind and all! I don’t juice or smoothie orange rind – u can do it but it’s just too bitter for my taste! Veggie Juice Fights Alzheimer's And Heart Disease Too! Before You Smash That Pumpkin, Juice It!